Tom and Chris Bethscheider at their store front. For 45 years, Chris and Tom Bethscheider of Cedar Rapids have been proud business owners. When asked about this milestone, the couple probably won’t tell you about the many long days or hard work that it took to get to this point—but they will tell you how very grateful they are for the community’s support over the years. 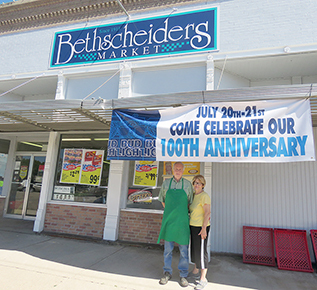 This year, Bethscheider’s Market in Cedar Rapids will celebrate its 100th anniversary. It wouldn’t be a celebration without a party, though, so the Bethscheiders are hosting a special event at their store this Saturday, July 21. There will be games, prizes and a free meal. The lottery will be on site, as well as Brandy’s balloons. Free kettle corn, candy, and ice cream will be offered. There will even be a drawing for 24 bags of free groceries. 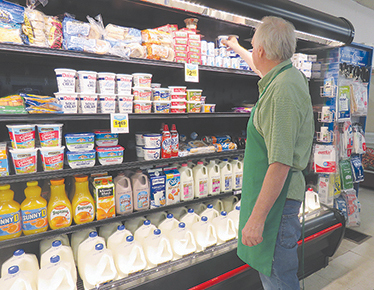 Bethscheider’s Market was founded in 1918 by Tom’s grandfather, Carl Bethscheider, who saw the need for a grocery store in town. The store was then passed down to Tom’s father, Carroll Bethscheider. And finally, in 1973 Tom took over. Chris and Tom said things kind of fell into place. Even though he wasn’t sure he would take on ownership of the store, Tom attended business school in Grand Island to further his studies. And, prior to inheriting ownership, Tom was always involved in the business. Without a doubt, his commitment to the community is one of the reasons why the store has continued to be successful over the years. Tom stocks a shelf at his store. When he’s not doing other tasks, Tom can usually be found behind the meat counter, preparing the meat. Read the complete story in the July 18 Albion News & Petersburg Press, Print and E-Editions.